The new Ford Focus is a true competitor to the VW Golf. FORD'S answer to declining small-car sales: move upmarket. The Blue Oval brand has put all its know-how into the new generation Focus hatch to stem the tide of buyers switching to SUVs. However, when it arrives in Australian showrooms in November, the extra technology will come at a cost. 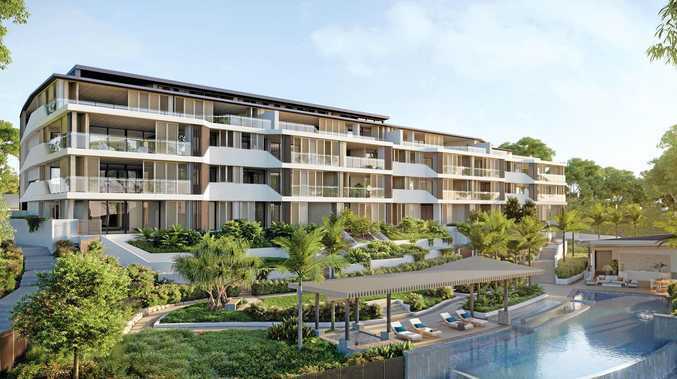 Australia will get three models initially, starting with the Trend from about $25,000. The sporty ST-Line and luxury Titanium editions will be priced either side of $30,000 but with options added the latter will eclipse $40,000 on the road, dearer than most rivals. Ford also will introduce a Focus wagon in one model grade: ST-Line. It's designed to appeal to buyers who want the practicality of an SUV without the baggage of owning one. In Europe, sales of small wagons have remained steady while hatches have tanked. Ford is banking on a similar trend in Australia. Thrifty ride: A new turbo three-cylinder delivers good fuel efficency. To hedge its bets, early next year Ford will add the high-riding "Active" based on the hatch. It might look like Ford's answer to the Subaru XV but it'll be front-drive, as with the rest of the Focus range. The Focus for now languishes at the wrong end of the top 10 small-car sales list. The first completely new model in six years is designed to boost its chances by aiming for premium rivals. 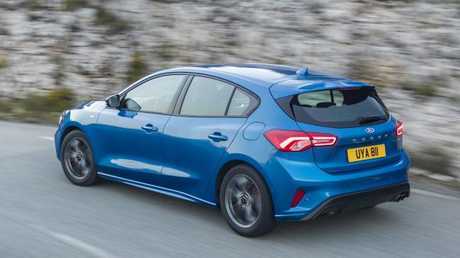 The rear end has hints of the Mercedes-Benz A-Class hatch, the side glass is shaped like a BMW 1 Series and the front and haunches have similar bulges to a Mazda3. In the metal the result is a refreshing take on the small-car theme - what's more, its beauty is more than skin deep. 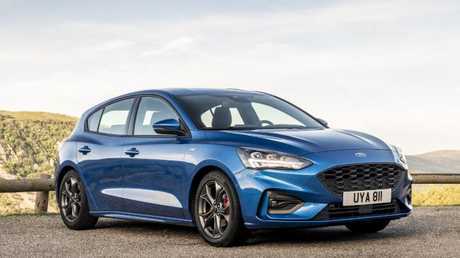 Ford started with a clean-sheet design that made the German-built Focus wider, lower and roomier, while still able to fit in the same size parking space as before. The cabin has half as many buttons as the current Focus and the design is simpler and more practical. European flavour: The Ford Focus is made in Germany. The door pockets are carpeted, as in the VW Golf. The automatic gear lever has been replaced by a rotary dial, similar to that used by Jaguar-Land Rover. There's a tablet-style touchscreen in the middle of the dash, as in Audi, BMW and Mercedes cars. Under the bonnet, there's another big change. The new Focus is powered by a three-cylinder turbo that's paired with an eight-speed auto or six-speed manual. There's no need to fret about power. It's no slingshot but its performance is on par with other small cars with four cylinders. However, there is a noticeable vibration at idle and once on the move. 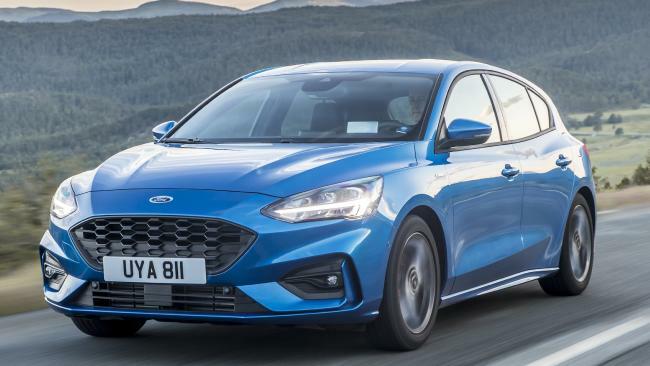 It's a trait of three-cylinder engines that Ford's engineers have muted well but you can still feel it from the seat of your pants and through your foot when pressing the brake pedal. This is just one of the compromises for frugal engine technology. The other is the need for expensive 95 RON premium unleaded. Stretch out: Ford’s new Focus is roomier than the outgoing model. The eight-speed auto is a smooth operator when accelerating from rest. It doesn't drone like the continuously variable transmissions in the Toyota Corolla, Honda Civic and Subaru Impreza and doesn't hesitate from rest, as with the twin-clutch autos used by Volkswagen, Skoda and Renault. However, some shifts can be a little abrupt, such as when the auto skips a couple of gears as you floor the throttle to overtake - or occasionally when the car is coming to a halt. It's a minor criticism and one we suspect will be addressed with a subtle software update. Most impressive is the way the new Focus hugs the road. With the assistance of the broader footprint and well-sorted suspension, it glides over country roads. That said, the preview drive was held on spectacularly smooth surfaces that favoured the car, so we'll reserve judgment on how well it might handle a decent bump. The Focus has decent cargo space. The grip from the 17-inch Continental tyres was superb. Grip usually comes at the expense of longevity, so replacing tyres early could become costly. Overall, it's an impressive effort and one likely to put the Focus back near the top of its class - if not in sales then at least as one of the benchmarks for driving enjoyment. The new Ford Focus is as German as a Volkswagen Golf - but will buyers pay a premium for it? Expected to go from $25,000 to $40,000, as it does today. Dearer than most mainstream rivals. Prices to be confirmed before arrival here in November. Autonomous emergency braking, lane keeping assistance and rear camera are standard. Auto parking, speed sign recognition, rear AEB, wireless phone charging, head-up display (on retractable plastic screen) and radar cruise control with stop-go will be available. Wi-Fi hotspot, phone app that remotely monitors the car and hi-tech suspension not initially available on Australian cars. The sole engine, 1.5-litre turbo triple drives front wheels via an eight-speed auto or six-speed manual. On Ford's claimed times, it's a touch faster than a Toyota Corolla and a bit slower than a VW Golf and Mazda3. The fourth-generation Focus platform is new from the ground up and has a bigger footprint, enabling major suspension revision - although hatches sold in Australia initially will come only with a torsion beam rear end. Compared to its predecessor the body is wider and lower. 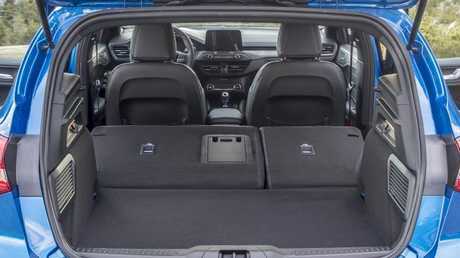 Bumper to bumper it's about the same as before - and slightly longer than a Golf or Corolla - but the new layout creates a roomier cabin.